At least eight people were killed and nearly a dozen more were injured when a truck driver deliberately mowed down people and targeted a school bus in lower Manhattan Tuesday in what authorities called a "cowardly act of terror." 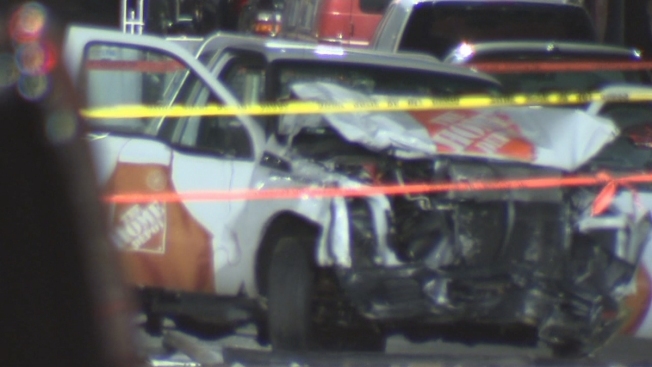 A 29-year-old Uzbek national living in New Jersey, Sayfullo Saipov, drove a Home Depot rental pickup truck at least 10 blocks down the popular Hudson River Greenway bike path from West Houston to Chambers streets, hitting nearly a dozen pedestrians and bicyclists before crashing into a school bus near Stuyvesant High School and elementary school P.S. 89, just a few blocks north of the World Trade Center, authorities said. The crash into the school bus appeared to be deliberate; witnesses told police they saw the driver swerve the truck to target the bus, which was carrying children. They said the driver then screamed "Allahu Akbar" in the truck, then emerged carrying what turned out to be a pellet gun and a paint gun and started running around before he was confronted by a nearby uniformed officer on patrol, who shot him in the abdomen. Law enforcement sources said Tuesday night that authorities found a note inside the man's truck -- rented from a Passaic Home Depot an hour before the rampage -- saying he committed the attack for ISIS. 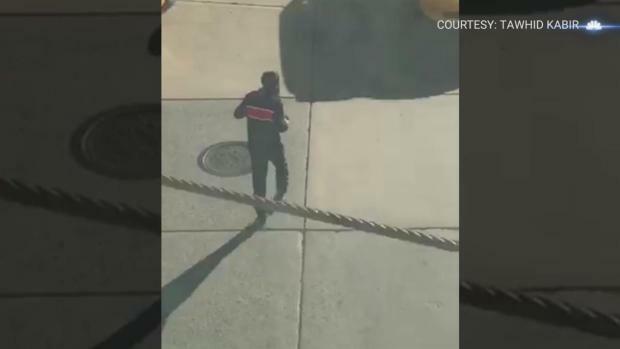 Witness video shows the suspect in a Lower Manhattan truck rampage running through traffic with what looks like two weapons. For the latest updates on this story click here. One witness told News 4, "A guy got out with a biker jacket with a stripe, and started shooting up the place. All the kids were in the courtyard at P.S. 89 and started running." Another woman standing at a bus stop nearby said she saw children and teachers from P.S. 89 screaming and running back into the school around dismissal time. "A man said, 'Run, run for your life,'" said Margaret Yearwood. The witness who saw the truck driver emerge from the pickup went to go help the school bus driver after the crash. "I wasn't sure why he was so spaced out and then I went to the other side, it was all caved on. A poor girl was stuck right above the wheel well. There were two kids that were just stuck by the window. It was all blown out," he said. Another witness described a gruesome scene along the bike path; amid the heaps of twisted metal and mangled bikes, he saw two victims laying unconscious on the ground: "One gentleman’s leg was hanging by skin. Another man had tire marks across his chest. His eyes were open." Six of the victims were pronounced dead on the scene, according to FDNY Commissioner Dan Nigro. They were all male. Two other victims were pronounced dead at local hospitals. Nearly a dozen people were taken to hospitals, many with serious but non-life threatening injuries. Saipov was also taken to Bellevue Hospital after he was shot by police. 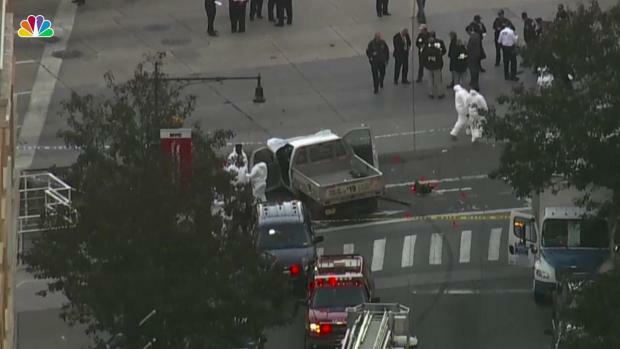 Listen as emergency responders react to reports of an out of control box truck in lower Manhattan. For the latest on the deadly incident click here. Sources initially said they were responding to a report of at least five people shot; in fact, all the victims in the case appeared to have been injured or killed from the truck crash. "There was a loss of innocent life," NYPD Commissioner James O'Neill said at a news briefing Tuesday evening. "The dead and injured were just going about their days, heading home from work or from school, or enjoying the afternoon sun on their bicycles. This is a tragedy of the greatest magnitude." Mayor de Blasio condemned the "particularly cowardly act of terror aimed at innocent civilians" and said it would not break the city's spirit. 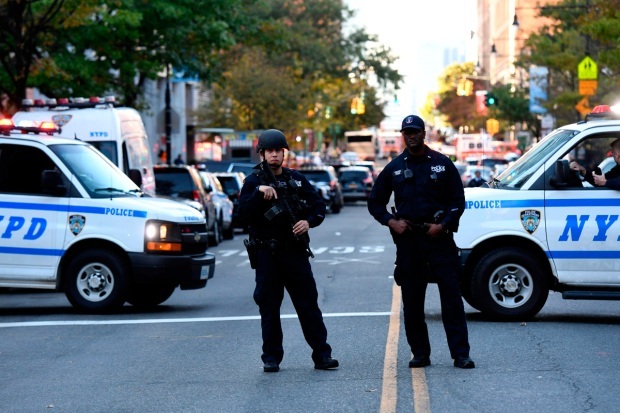 He urged New Yorkers to be more vigilant, and said police presence would be stepped up across the city, adding, "New Yorkers are resilient; our spirit will never be moved." Mayor Bill De Blasio speaks out against the 'cowardly act of terror' that killed at least 8 people in lower Manhattan Tuesday afternoon. To that end, the NYPD said the famed Village Halloween Parade would proceed Tuesday evening, though with more police officers and resources, including blocker vehicles, sand trucks and weapons teams. Stuyvesant High School, P.S. 89 and P.S. 289 were put on lockdown in the chaos and confusion after the crash. Stuyvesant High School sophomore Areyan Kayum said he was in class when he heard the crash; students rushed to the window and saw the destroyed school bus below. The school was immediately put into shelter mode. "I'm just glad I'm safe and everyone in the school is safe," said Kayum. Parents were seen picking up their children from the elementary schools after the lockdown was lifted; many of the kids were in Halloween costume and makeup. Schools chancellor Carmen Fariña said, "Today there was an act of terror in close proximity to several schools in lower Manhattan. We stand with the entire city as we mourn this senseless loss of life. We are grateful to the first-responders and school staff who work tirelessly to help keep our schools and communities safe. Ongoing guidance and trauma counselors will be provided across schools to those in need tomorrow." Gov. Andrew Cuomo said there was no evidence to suggest the "lone wolf" attack was part of a wider plot. A U.S. counterterrorism official told NBC News that the intelligence community is unaware of any claims of responsibility in the attack at this time. On Twitter, President Donald Trump called it "another attack by a very sick and deranged person" and declared, "NOT IN THE U.S.A."
In NYC, looks like another attack by a very sick and deranged person. Law enforcement is following this closely. NOT IN THE U.S.A.! My thoughts, condolences and prayers to the victims and families of the New York City terrorist attack. God and your country are with you! Tuesday’s attack bears resemblance to several attacks where a vehicle was used as a weapon in recent years. In 2014, ISIS called on so-called lone wolf attackers to use their cars to kill people if they couldn’t get their hands on weapons. Two years later, an attacker plowed a cargo truck into hundreds of people celebrating Bastille Day on a beachfront promenade in Nice, France, leaving 86 people dead. Since then, there have been at least 11 other instances where attackers used cars to kill dozens and injure many more. And earlier this year, a driver from the Bronx jumped a curb in Times Square and hit nearly two dozen people as he drove on the sidewalks -- allegedly intoxicated by PCP -- for three blocks. The NYPD and FBI are asking anyone with information about Tuesday's attack should call Crime Stoppers at 1-800-577-TIPS or the FBI's tip line at 1-800-CALL-FBI.